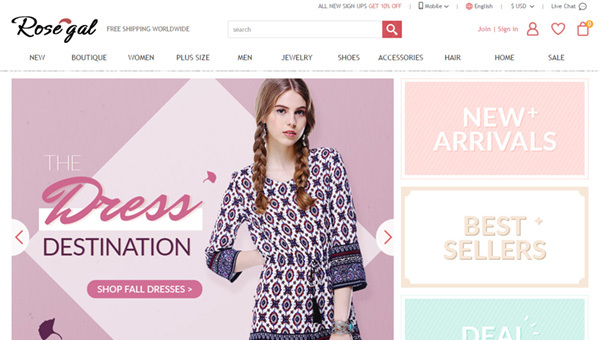 Rosegal – is a Chinese online shop of men's, women's clothing and shoes. You can also find accessories, wigs, home decoration items, covers for iPhone, kitchen and household appliances. The shop was founded by a group of friends who had a deep passion for fashion and beautiful things. The shop is special due to its love of vintage things. As stated in the description of the website: vintage is a style that never goes out of fashion. So if you're a fan of such clothes, welcome to Rosegal. However, vintage is not the only thing – the service offers a wide range of fashion and everyday products that will satisfy the most demanding customers. As for prices, here you will find a pleasant surprise, since the price is quite low, and the quality of goods is not inferior to other online stores with similar product offerings. The website, like most of its competitors have special offers for its regular customers. By clicking the Make Money button you can make money on this site - they pay you for every purchase that was noticed in any social resource or media channel, such as on its YouTube channel, Instagram page, Facebook, etc. They also have the RG points program where 50 RG points = $1, you can earn points by adding photos of your purchases. You can pay for the purchase with a credit card (Visa, MasterCard, JCB, Discover and Diners), and PayPal. Delivery is carried out by three methods Expedited Shipping 3-7 business day, Standard Shipping 6-8 business day and Flat Rate Shipping 75-25 business day, the latter method is free. I have made many orders from Rosegal without any issue and with good prices. So, great, great prices, huge variety of items. I am very satisfied and I am looking forward for more orders!